5 minutes to make ,15 minutes to bake! 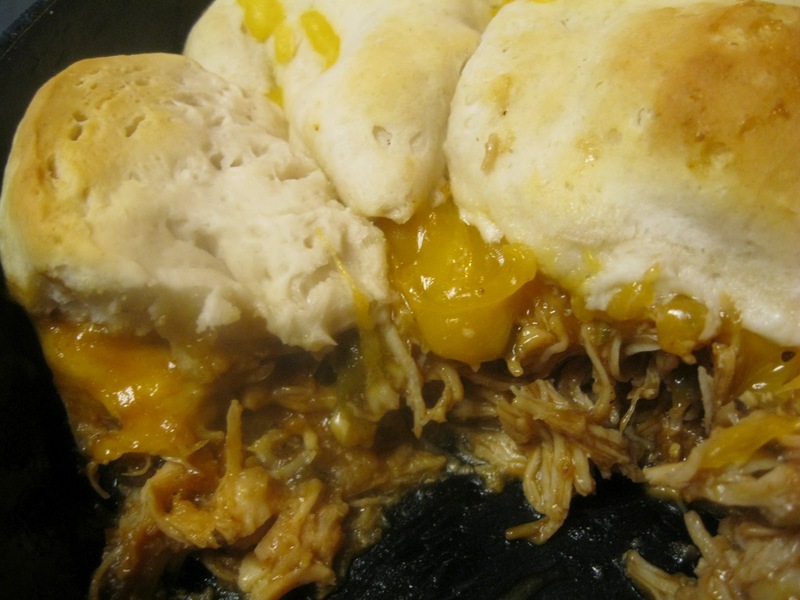 This quick & easy skillet supper made of bbq chicken, cheddar cheese and biscuits can be made with left over rotisserie chicken, or use you chicken master mix, or earlier in the week if you are cooking chicken, cook a few extra's to make this quick dinner later in the week. I actually thought this up one night when I was standing in front of the fridge at 4:30 pm wondering what to cook for dinner. I saw that I had left over chicken breasts and a can of biscuits. I used a cast iron skillet, but a casserole dish would be great too! I used a can of store bought biscuits but can imagine how tasty some homemade cheddar/garlic/bacon drop biscuits would be if you made them from a bisquick type mix. Jan's tip: This would make a great freezer meal! Go ahead and invest in an aluminum pan at the dollar store and follow the directions to assemble this supper. Then after it is assembled wrap tightly in foil and freeze. If thawed, bake as directed below. I've never baked this straight from frozen, but I'm thinking 30 minutes or so to bake the biscuits to golden brown. Pre heat oven to 375 degrees. In a mixing bowl mix together shredded chicken and bbq sauce. Pour chicken mixture into skillet or baking dish. Top with shredded cheese. Top with biscuits. 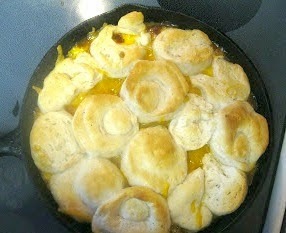 Bake 375 degree oven 15 minutes or until biscuits are golden brown and cheese is bubbly.